Erik Johnson sent a tweet of Carolyn Swords of the WNBA (formerly Boston College) sealing for an offensive board and put back. I asked him about that specific play and he provided a simple explanation that I never considered. In any type of defense where the weak side defender is helping, there is an opportunity for an offensive rebound. The offensive player (5 here) must sprint to get some of the paint in order to seal for a long weak side rebound. As 2 shoots the ball here, the defender ideally wants to sprint and hit the offensive player outside the lane. Given the body position of this player though, that might not be possible. Winning this sprint and out-hustling the defense to just get some of the paint is critical especially on longer rebounds. I asked Coach Johnson about the possibility of a foul on the offense. He said as long as you win the spot and do not push off, you as the offense are entitled to the spot. The defensive drill above is another simple drill that I stole from Erik Johnson. It is an easy and competitive way to incorporate what Coach Tanglis called the boring, but necessary skills. Box outs and close outs. The idea for the offense is to shoot it quick. Sometimes that means that the 3 can shoot it right away in the diagram above. This forces x3 to give an honest effort in the close out. Other times if the offense reverses the ball, each player is getting a close out rep and the player boxing out the weak side is different. The offense should look to shot fake and drive to uncover poor close outs. 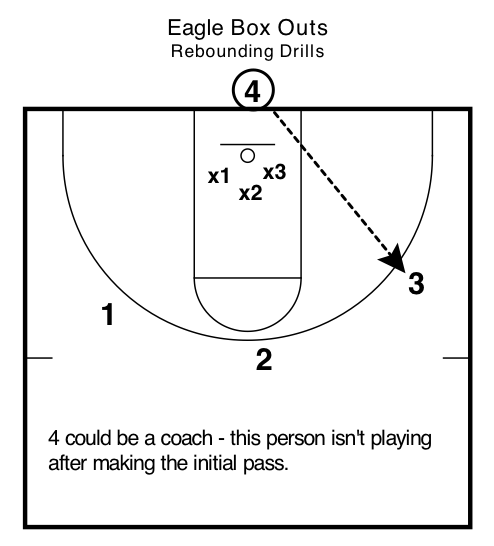 Coach Johnson stressed that this is designed as a box out drill, so the more the offense moved and passed the ball it meant that players were getting less reps boxing out. 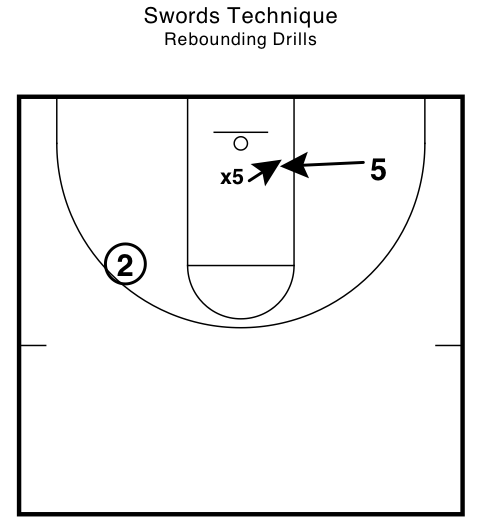 Anything more than two passes probably defeats the purpose of the drill. He also recognized the importance of making it game like which is why he told the offense (often times practice players) to move the ball or shot fake. Most coaches will drill one particular skill and then watch the skill deteriorate in a scrimmage. I asked Erik Johnson his position on drilling for box outs. He agreed that players do have a harder time remembering technique in game-like situations. Almost any skill taught in isolation will suffer after it is brought back into the general game. Drilling the skill is a requirement for muscle memory and developing I.Q. Some players do eventually box out automatically, but it will not happen unless they get box out specific drills to help them along the way.